My father died of cancer at the age of 70. His death, with about three months notice, was a shock to all of us in the family. He was a relatively quiet, very humorous, intelligent man. For the most part, he educated himself. His greatest advances in education came when, at the age of 17, he joined the Coast Guard and went to war. The frustrating thing about being my father’s son was that he wasn’t a real talker, and never talked about his feelings. It wasn’t done in his generation, and so it fell on me often as I was growing up to guess what he was thinking. While going through files today with Shelly, I came upon a book I had looked through a few times before. And as it had done times before, it brought before me a view of my father that I would otherwise have never known. When the Coast Guard was added into the United States Navy during World War II, Dad found himself being shipped off to the South Pacific. 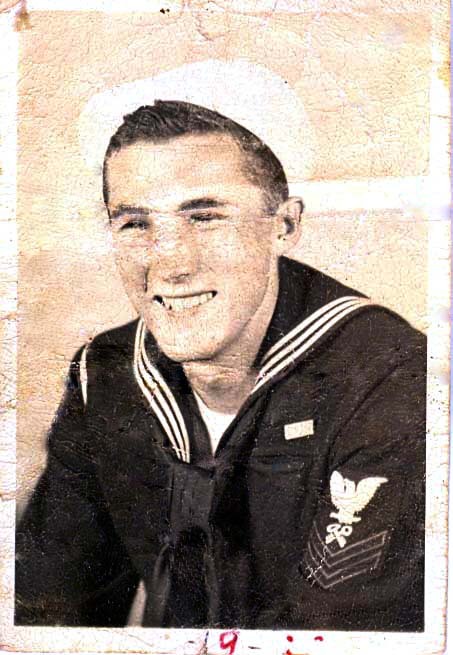 He had told me that he had served on an LST (Landing Ship Troops) and further served as radioman and gunner on a landing craft, landing troops for many of the invasions that happened in the Pacific: Guam, Saipan, Leyte, and eventually Okinawa and Iwo Jima. He saw his share of combat, and lived to tell about it. The book that I have in my possession is his journal during 1944 and 1945. War movies have it all wrong. There’s no indication that he was eager to get into battle, or the opposite, that he dreaded it. In fact, most of it is relatively mundane. That’s something for me as a writer to remember. The fabric of our lives is made up of the mundane. His talk is of his son, Lonnie (my half-brother) and includes poems in it about home and about how he longed to see his son. There’s one page where he lists how much money he has in savings, how much others owe him, how much he would receive when he mustered out, and how much he would need at the end. His goal? To buy a piece of property in San Jose, California, the place he eventually lived after the war. On another page, there are five blue slips of paper with the words, “Receipts for Remitter.” They are stamped New York City with cash totals of $50 or $100 on each of them. I really don’t know what they are, but I would guess they were either pawnshop tickets, or some form of savings that was used by the military. “July 17, 1945: Received word today, all gypsies [ships?] get under way on or about the 22nd of July. Looks like a big one this time as there are 104 LSTs here at Leyte Island in Philippines. “July 26: Got under way for Subic Bay for troops with five more LSTs. Had gun practice. 70 shot down the sleeve behind a TBF [an airplane]. “July 29: Hit Subic Bay. Two men over the hill [AWOL] to Manila. “August 1: Loaded with army troops for Iwo Jima, north of Okinawa. “August 6: At Okinawa. Can’t unload yet. “August 10: Went up and unloaded troops [at Iwo Jima]. Some guys say they saw Ernie Pyle’s grave. “August 11: Back to Okinawa waiting orders for last push. They brought out the atom bomb a couple of days ago. Everybody tickled to death. “August 15: War is over. Two things strike me as I read his words. First, he writes from a world that is totally alien to our experience. To be removed from everyone you know and love, to live among strangers for months and years with the purpose of killing other people, is something I have a difficult time comprehending. Second, even though he lives in this alien existence, he is just like you and me. Soldiers and sailors don’t grow up that way. They have lives they leave when they go off to war, and they have lives they dream of while they are away. War is not reality. It removes men and women from reality. It’s when war is finally over–whether it’s on an individual basis or a a worldwide basis–that reality has permission to continue. Reality, when you get down to it, is pretty mundane. And that’s OK.
WOW! i NEVER knew that stuff about Uncle Glen. Thats amazing.. I sure do miss them both.. Interesting information to find out about such a close part of our lives. It would be interesting to take the diary and use it for reference and write a script of WWII. I have a stack of many letters my dad wrote to my grandma when he was enlisted in the Marines. The envelopes are worn and yellow, though most likely not as old as your father’s journal.